Back in 2002, I was hired as the first payroll employee for Quantrix. I am now approaching my 10 year anniversary at Quantrix so I thought it would be fun to take a look back at our product release history. We have certainly accomplished a lot in the past 10 years! After 14 months of development, Quantrix 1.0 was released to the world. This version introduced our core concepts of multi-dimensional matrices and formulas separated from the cell structure. We leveraged the internet to market our product and our first sale came from a small consultancy in France. As we received feedback on our first version, subsequent version 1 dot releases were made available that introduced the beginnings of data import, HTML export, the Quantrix API, and Export to Excel. Quantrix 2.0 introduced our popular DataLink functionality that allows Quantrix to connect to a wide variety of data sources. Scalability of Quantrix models was a key aspect to this release as we were finding that with increased flexibility, users were creating much larger models than we originally anticipated. 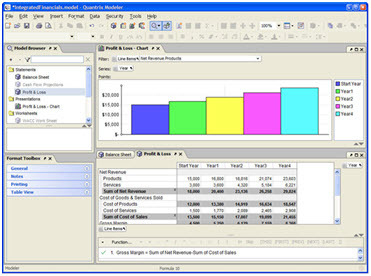 Subsequent version 2 dot releases introduced more fine-tuned controls for DataLink and more features in the charting package as well as OS X compatibility. 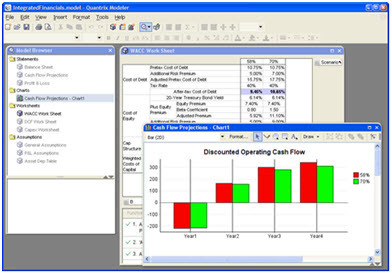 Quantrix 4.0 focused on usability and performance. The Quantrix Qloud was introduced which was our first foray into thin-client model delivery. We also made significant improvements to our calculation engine where some models showed up to 85% improvement in calculation times. Scripting was introduced to our users as a way to automate repetitive user tasks in a model. Version 4 dot releases introduced a problems panel to identify and fix formula errors in one location, images and hyperlinks support in cells as well as improved charting controls. We are not quite ready to let the cat out of the bag yet, but it is safe to say we are thinking web-based, multi-user solutions in a BIG way. We want to make the process of building models easier for the core groups of modelers in an organization and allow for many users to view and use models via web browser. Exciting times are ahead so stay tuned! Mike Salisbury oversees the Customer Support and Quality Assurance programs at Quantrix and helps set the product direction and strategy of the Quantrix Modeler application. Mike enjoys meeting with customers to discuss how Quantrix is used in their organizations and brainstorm ways to improve the application. You can contact Mike at msalisbury@quantrix.com.